The Two Flavors of a ‘One Web’ Approach: Responsive vs. Adaptive. "You’ve probably heard people say we’re living in a “post-PC world.” What does that mean for web developers? It means that 30% to 50% of your website’s traffic now comes from mobile devices. It means that soon, desktop and laptop users will be in a minority on the web." "For developers that means that taking a One Web approach ensures that not only does your site work on the smartphones and tablets of today, but it can be future-proofed for the unimagined screens of tomorrow." 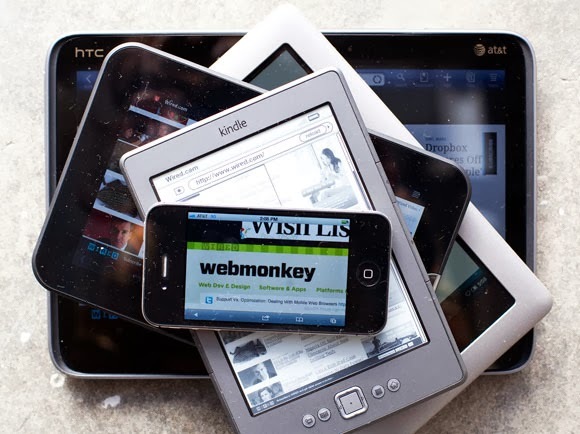 "Responsive web design is the most common One Web approach. The approach uses CSS media queriesto modify the presentation of a website based on the size of the device display. The number of responsive sites is rapidly increasing, from the Boston Globe to Disney to Indochino." "A key advantage of this approach is that designers can use a single template for all devices, and just use CSS to determine how content is rendered on different screen sizes. Plus, those designers can still work in HTML and CSS, technologies they’re already familiar with. Additionally, there’s a growing number of responsive-friendly, open-source toolkits like Bootstrap or Foundation which help simplify the process of building responsive sites. On the other hand, there are few shortcuts to a sound responsive design. To go responsive, organizations often have to undertake a complete site rebuild." "The design and testing phase can be quite fussy, as it can be difficult to customize the user experience for every possible device or context. We’ve all seen responsive site layouts that look like a bunch of puzzle pieces that don’t quite fit together. Responsive web design works best in combination with a mobile-first approach, where the mobile use case is prioritized during development. Progressive enhancement is then used to address tablet and desktop use cases." "While responsive design is fast becoming the de facto standard, it also creates new challenges for online businesses, including how to handle images, how to optimize mobile performance and often means sites need to be rebuilt from the ground up with a mobile first approach." "A client-side adaptive approach means you don’t have to rebuild your site from the ground up. Instead you can build on existing content while still delivering a mobile-responsive layout. For expert developers, this approach also enables you to specifically target particular devices or screen resolutions. For example, for many of Mobify’s online fashion retail clients, 95% of their mobile traffic comes from iPhones. Client-side adaptive means they can optimize specifically for Apple smartphones." "We can achieve the server-side adaptive approach in a variety of ways, through server-side plugins and custom user agent detection. Sites that use server-side adaptive include Etsy, One Kings Lane and OnlineShoes.com. Why choose server-side adaptive? It typically offers distinct templates for each devices, enabling more customization, and it keeps device-detection logic on the server, enabling smaller mobile pages that load faster. Additionally, there are numerous server-side plugins available for common CMSs and eCommerce systems such as Magento." "This approach isn’t for the faint of heart–it typically requires significant changes to your back-end systems, which can result in a lengthy (and costly) implementation. The requirement to manage multiple templates raises ongoing maintenance costs. Finally, this approach can encounter performance issues when servers are under heavy load. When mobile user agent detection is performed on the server, a lot of common caching mechanisms deployed by CDNs like Akamai need to be turned off. This can result in a slower user experience for mobile and desktop visitors." Few days back I was unable to understand mean of 'Responsive' But when I heard about the Responsive design and did some R&D than I came to know that WHAT IS RESPONSIVE ?